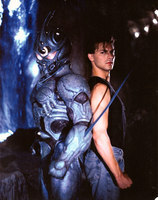 Plot Summary: Sean, The Guyver, copes with living after the fall of Chronos. After catching wind of possible Zoanoids in the form of werewolves, he heads out to a dig site in Utah. There, he discovers that Chronos is alive and well.